Filmmaker Nick Broomfield is the man behind such unforgettable documentaries as Kurt and Courtney and Aileen: Life and Death of a Serial Killer. He recently strayed from the documentary format with 2006�s Ghost, and his latest film, Battle for Haditha is also a �fictional film.� Still, Broomfield remains at least somewhat close to his documentarian comfort zone, in that Haditha�s cast features actual ex-Marines playing the American soldiers and mostly non-actors in the Iraqi roles. Hardly seen outside of film festivals, this amazing film finally has a chance at the wide audience it deserves, thanks to Image Entertainment�s DVD release. The Marines of Kilo Company are stationed in Iraq, and immersed in the realities of war. They spend their days monitoring intel and exploring houses and dwellings where Iraqi insurgents are suspected of staying and planning attacks against the Americans. Much of their time is also spent avoiding the numerous road-side bombs that are planted throughout the country. While the peaceful people of the town of Haditha prepare for family-oriented celebrations and continue to hope for normal, everyday lives, they are unaware that terrorists led by Ahmad (Falah Abraheem Flayeh) have planted a bomb in their normally peaceful street. As the terrorists wait to detonate the bomb, they can�t possibly be prepared for the U.S. Marine retaliation that awaits them once the fatal button has been pushed. Broomfield�s film also eschews rather close to his documentary roots by using the aftermath of a roadside, IED bomb that went off on November 19th, 2005 as inspiration for his story. The blast killed one marine, while injuring two others and the surviving soldiers took their anger out on any Iraqi that they even slightly expected to be involved in planting the bomb. Broomfield captures this retaliation in the most shocking war movie sequence I�ve seen since Private Pyle�s mental breakdown way back in Full Metal Jacket. The faint of heart will have difficulty making it through this part of the film, but Broomfield�s willingness to show this in one drawn-out, grueling set piece almost singlehandedly makes this the best film yet to chronicle the Iraq War. An accomplishment such as this is what Brian DePalma�s recent misfire, Redacted could have been. Where that legendary director seemed a bit too interested in making a �personal� Iraq War film, the relatively unaccomplished Broomfield concentrates on the most important aspect of this conflict, the people directly involved. He devotes nearly equal amounts of screen time to the Marines and the Iraqis but never force-feeds the audience with overly melodramatic sequences or manipulates us to feel one way or another towards a particular person or cause. It�s also refreshing to watch a film about the subject that isn�t overly concerned about the politics of the war. This is not only proof that Broomfield should make more fictional movies, but it�s also, finally, a great film about the Iraq War. While he�s always been extremely opinionated when it comes to his documentaries, Broomfield steps back here and allows us to wrestle with the difference between who�s right and who�s wrong in the film. Such a question mirrors a larger discussion involving the existence of the Iraq War itself, and the conclusion that we might come to in the end is that there is no clear-cut answer to such a quandary. Image Transfer Review: The 2.35:1 anamorphic widescreen presentation faces some of the inherent shortcomings of being shot on digital video, but things look as good as they possibly can. For much of the running time, things look like they were actually shot on film, as we get sharp, nicely detailed images. There�s also very little grain, which is another nice surprise given the digital video camerawork. Audio Transfer Review: The audio is available in both Dolby Digital 5.1 and 2.0, with the former being the track to choose. The surrounds are used quite a bit, along with deep, aggressive bass to heighten the intensity of the action-oriented sequences in the film. The dialogue never falters either, remaining crisp, clear, and seamlessly integrated into the overall mix. Extras Review: A nice extras collection begins with a pair of audio commentaries. The first is with director Nick Broomfield, and in it we�re reacquainted with the man that has narrated his earlier documentary features. As in those films, he is extremely engaging, in explaining each and every aspect of the filmmaking process, seemingly touching on every aspect of this film that the audience could want to learn more about. The second track features actor Elliot Ruiz, who portrayed Cpl. Ramirez, the central military figure in the film. His discussion isn�t as interesting as Broomfield�s, but he still offers up some nice information from a much different perspective. Along with the theatrical trailer for Battle for Haditha, we get The Making of �Battle for Haditha�, a 51-minute documentary that is a bit too long, despite some nice, candid looks at the shooting of the film. Next, A Soldier�s Story: In Conversation with Eric Mehalacopoulos spends 11 minutes with the titular actor, who explains his role and his former life as a soldier. In the Line of Duty: An Interview with Elliot Ruiz, is a 20-minute sit-down with the actor/former Marine, during which he touches on a few of the same items from his audio commentary, but is still very interesting to listen to here. We wrap things up with the casting tapes for Andrew McClaren and Elliot Ruiz. Running a total of 25 minutes, these are a great look at what really goes on during the casting process. 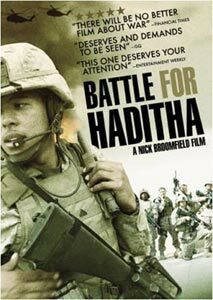 I, for one, am hoping that we haven�t seen the last of Nick Broomfield as a documentary filmmaker, but if he�s going to focus on actor-driven films, Battle for Haditha is a sign of great things yet to come. This is the most moving, realistic, and shocking account of the Iraq War we�ve yet to see on film, and Image Entertainment brings it to DVD with a trifecta of great audio, video, and extra features.